Sol Duc River, Winter green. Since last Easter Sunday our rivers received a good solid hit of warm spring rain, spread over a few days of time. The flows went straight up quickly. By Saturday and Sunday night, as the storms cleared, and the colder temperatures set up in the Olympic Mountain foothills again, the flows have been dropping precipitously, into a near vertically descending profile of what will, hopefully, become some very good fishing flows ahead. So if this works out it is likely going to be our propitious opportunity to swing those winter flies on the bigger water again, in these last few weeks of wild winter steelhead season. After the 15th of April we will be focused on the Quillayute River System waters- the Bogachiele and Sol Duc rivers in particular. If you want to come out here with me, you had better call in and let the boss know that you are feeling too well to work, and let's get a few days on the water here now. Get your priorities straight here please! Once the end of April comes along you will be wishing you had been a lot less responsible and provident. And you will have a whole year ahead of you to regret not coming. Warm rains have another spike in flows hitting the rivers right now. But the short term trend is toward colder and drier ahead. We will have to watch this cycle daily now. I am hoping for a decent flow scheme by Saturday and Sunday. Your best bet right now will be the upper Bogachiele River, for better clarity, and the lower Sol Duc River, better opportunity, and even the Quillayute river, between Tribal netting schedules. Kush came down from B.C. Please, someone, give this man a cigar. Some very good people have worked hard on this issue- to reopen the late winter steelhead Catch & Release fishing season on the Skagit River. In an effort to engage the mangers in WDFW and the Federal agencies involved, and to work within the Endangered Species Act requirements, these people have organized to call attention to the issues involved, and to present a case for reopening before the WDFW Commissioners, including public testimony at the next Commission meeting on this coming Saturday. None of this is simple or easy. And of course it involves several layers of regulation and bureaucracy. 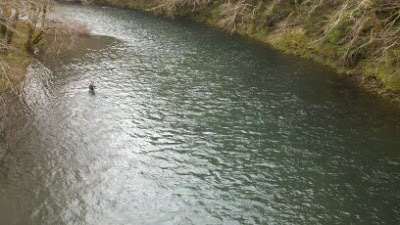 And as one great veteran of the Skagit River steelhead fishery said: "Without enforcement this will mean nothing". And we do have an enforcement deficit as the budgets cuts have defunded everything from mother's milk to coffin nails now. Last Saturday some of us gathered to support this cause, meeting up at the Howard Miller Steelhead Park in Rockport for a rally. This was a great turnout with good media support. And a few of the great names in pacific northwest steelheading came to lend their support. It would be great if you would do a little reading up on this here, and please consider lending your support in some form. Saturday April 13th will be another effort as the Occupy Skagit gang heads down to Olympia for the WDFW Commissioner's meeting. Come, Speak, Support! As many of you may know, our Olympic Peninsula rivers are being clobbered now, especially on the weekends, as so many hundreds of additional anglers have come out here to focus on these last great wild fish. Through the entire season this adds up to thousands of additional angling hours and days hitting the water. One Friday recently we counted over 50 drift boats and hundreds of anglers on the Hoh river alone. (now you know why I prefer guiding on weekdays here.) A scenario that is becoming all too common. And this has always been a major reason behind my decision to have avoided using rafts and boats on my trips here. We can walk in and get to some nice water ahead of the boats. And we can relocate to new water at any time, even to another river, often much more quickly than a drift boat can. And we avoid a lot of the snarky behavior that is so commonly displayed now, and not just by the guides. These rivers are not mine, and they are not yours- they are Ours. It is supposed to be fun people! This is why I am supporting Occupy Skagit: I am sure it will reduce the overwhelming fishing pressure that we are seeing here on the Olympic Peninsula rivers sometimes now. Why the hell WDFW did not plan for this in advance, when they closed the Puget Sound regional rivers to late winter fishing under the ESA listings, is beyond me! How could they not foresee this great influx of fishing pressure here, or not mitigate it at once? Not a few of these people are coming here to continue to kill wild steelhead too. It seems like the managers always wait until it is too late to benefit from more conservative measures. And instead of using Catch and Release as a stable, wild fisheries management tool, they use it as a last ditch effort to keep fishing open, and for keeping the license and sales tax dollars flowing. Catch and Release is not a fisheries recovery tool generally speaking. It is a management tool- when you have stable numbers of fish to begin with. Some very qualified people do feel that the Skagit system steelhead numbers have been stable enough, for some years running, to support a responsible C&R fishery there again. This would give our rivers and fish a much needed break. On the ferry to Occupy Skagit! P.S. The Chum salmon fry are moving into our area now! I have been letting the cutthroat fatten up on them a little bit for now. But it will be very soon that you will have to haunt the beaches at dawn to find me. Once I see the Salmon Berry blossoms along the steelhead rivers here, and the Hummingbirds buzzing about, and the brief, intermittent hatches of Blue Winged Olives, Crane flies and Stone flies- I feel this pull inside of me to get salty again too. I am suspended somewhere between winter and spring, steeped in the overwhelming beauty of life and nature, as one season ends and another begins. I wouldn't mind if we had another 60 days of winter, and wild steelhead fishing to revel in. But spring is so exciting, so sudden, that it alarms the senses. And last night I went for a walk at 7:30 and it was still light out. I am so ready for that. It's Chum Baby Time . . . Again! More Chum Baby flies are on their way to the Orvis Bellevue Fly Shop! Just in time for your spring Puget Sound Saltchuck fly fishing adventures! This well tested and proven fly pattern has been very productive on our regional sea run Coastal Cutthroat trout. And many other fisheries are seeing success with this fry pattern now; In Alaska, New England and beyond. A great general spring time fry pattern. 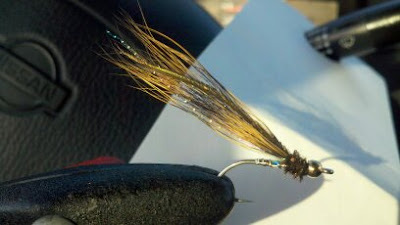 And not just for trout- Dolly Varden char and Smallmouth bass fly fishermen are doing well with this fly too. One of the fun aspects of developing a fly pattern is to see how other fly fishermen will use it over time, across the range of possibilities. And to see it work in salt waters and fresh waters, including still waters, is a real kick. I will send them right out to you! I look forward to helping you plan that last winter steelhead trip out here on the Olympic Peninsula with me, or maybe you are as excited about our sea run Cutthroat Trout beach season as I am- mid to late April through November- and we can talk about that too. Catch & Release, Fly Fishing Only. Fair-Chase; swung flies, one single barbless hook, No Bobbers, No Indicators.